A veces encuentro trabajos y patrones en crochet que me encantan pero que nunca me decidiría a hacer, como por ejemplo una manta. Eso es justo lo que me pasaba con esta preciosa manta hecha por Michelle Tang (pueden encontrar el patrón en el blog greetingarts.typepad.com y en Ravelry). Pero quería probar este efecto ondulado, así que hice algo más pequeño: una funda para el Kindle. Es muy fácil y se trabaja bastante rápido. Si pruebas con una manta, es el proyecto perfecto para las noches frías frente al televisor o escuchando la radio. Usé 7 colores como en un arcoiris, haciendo 2 filas de cada color con una aguja de 4 mm. El patrón trabaja sobre múltiplos de 14 puntos. Hice una cadena base de 6×14 puntos, más 3 puntos para la cadena de vuelta. Al terminar doblé por la mitad el trabajo igualando los bordes ondulados, y los uní con puntos bajos. * Sometimes I find crochet items and patterns that I love but would hardly ever crochet myself, such as a blanket. That’s what happened with this gorgeous blanket made by Michelle Tang (you may find the pattern at greetingarts.typepad.com and Ravelry). But I still wanted to try the ripple effect, so I made something smaller: a Kindle cover! It is very easy and it works up really fast. If you’re going to make a blanket it is the perfect project for cold nights in front of the tv or listening to the radio. 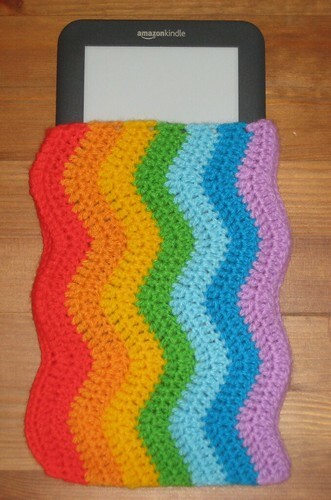 I used 7 colours in a rainbow fashion, making 2 rows of each colour using a 4mm size hook. The pattern works in multiples of 14 stitches. I made a starting chain of 6×14 plus 3 extra for the turning chain. Then I matched up the rippling sides and single-crocheted through both sides, stitching them together. And voilá! More photos over at Flickr. But your artwork is great! No, it's so easy, really. It looks like something you have to build but it just builds itself up. I've updated the post with some links to instructional videos for the 2 stitches that are used, in case anybody is interested to try it.